A while ago someone on Twitter asked about soy free miso and was referred to me for help. After a quick Google search in Japanese I found out that you can buy miso (and soy sauce) made from quinoa. This piqued my interest despite not having any food allergies myself -- just sensitivities to things I don’t really like anyway (dairy and peanuts). I thought that this would be a perfect topic for Surviving in Japan. Info source: Report from Ministry of Health, Labour and Welfare (2002, 2005)Chart translated from here. If you look through food allergy information in Japan you will come across a list of seven over and over again. These are: eggs, milk, wheat, buckwheat, peanuts, shrimp and crab. Products containing these ingredients are required to be labeled. Why these seven? According to the allergy handbook produced by the Japan Consumer Affairs Agency these seven allergens can produce the severest reactions (think anaphylactic shock). 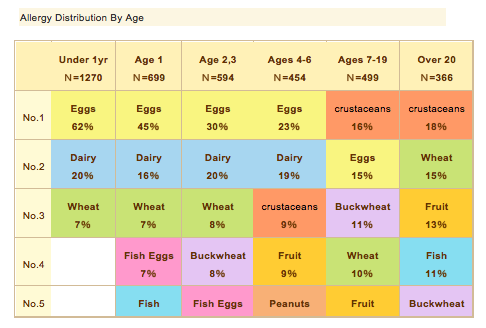 In Japan eggs, milk and wheat make up 70% of food allergies. The following is a list of the seven food allergens and how they will be labeled. I have included readings in brackets in the ‘Common Label’ column. Unless otherwise noted, the readings in the ‘Also Seen As’ column are the same. Food labels are not required to include allergy information for the following group but it is recommended. Pretty much all children’s products are labeled and some adult products are. The curry roux box in my cupboard mentions pork as a trace ingredient. The allergy handbook offers labeling guidelines for products containing allergens and products that have possibly come in contact with allergens. Look for these phrases and terms in the ingredients list (or below). The allergens are in red and the grammar structure is in black. This will be in brackets beside the ingredient in the ingredient list. Will be in brackets beside any ingredient that was made from soy beans. This will be in sentence form on the package somewhere near the ingredients list. Toumorokoshi no yuzou setsutou ha daizu, komugi no yuzou ni mo shiyoushiteimasu. This corn was transported using equipment that is also used to transport soy and wheat. Genzairyou no ichibu ni daizu wo fukumu. Raw materials contain traces of soy. What types of products are labeled? If a product contains a miniscule amount of one of the seven allergens it will be marked; however, if it contains just a few milligrams per kilogram it will not be marked. What types of products are not labeled? Note: While large companies have proper allergy labeling, I have noticed that some smaller companies/stores do not. If you don’t see any allergy labeling, it is probably best to err on the side of caution and ask. Coming soon: I'll explain how to find allergen-free products in Japan. Edit: Struggling to understand where and what to look for on the food labels? Check out the ultimate guide to reading Japanese food labels for everything you need to know.